This article has been created in order to help you by explaining how to remove LockMe Virus virus from your computer system and how to restore .lockme encrypted files. The LockMe virus is a new ransomware strain that is actively being pushed to computer victims worldwide. It seeks to cause a lot of dangerous system changes, steal sensitive files and process sensitive user files. The victims are left with encrypted data and several other malware installed on their computers. Read our in-depth removal guide to learn more about the threat. Short Description The main goal of the LockMe virus is to encrypt sensitive user files and extort the victims for a ransom fee payment. Symptoms The LockMe ransomware component processes target files and renames them with the .lockme extension. User Experience Join Our Forum to Discuss LockMe. The LockMe virus is being distributed using different tactics. At the moment the attack campaigns are still in their infancy and the experts cannot judge which is the primary method. We presume that the most popular strategies are going to be used. One of the most widely used strategies involves the coordination of spam email messages. They utilize social engineering tactics in order to coerce the victims into interacting with it. The criminals can bundle the malware files as attachments. They are disguised as useful software or may be placed inside archives. Another email tactic includes the inclusion of hyperlinks that often pose as password reset links, login pages and etc. In some cases the criminals can also use infected documents that contain malware scripts. They can be spreadsheets, presentations or rich text documents that when opened present a notification prompt. The targets are asked to enable the built-in scripts (macros). If this is done the virus infection follows. 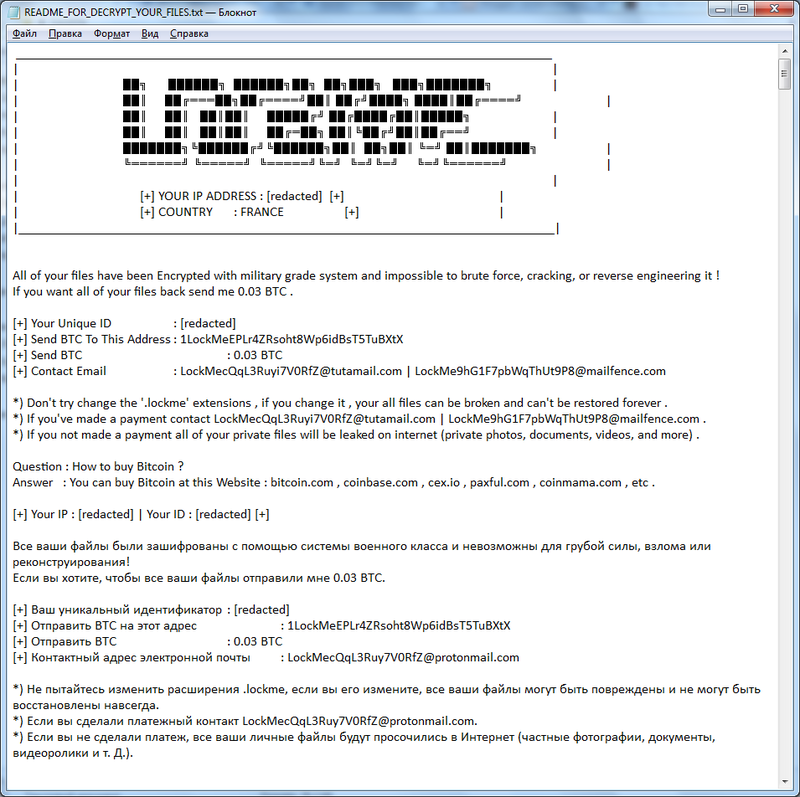 Hacker-controlled pages can also serve the malware files using a similar methodology. They are often disguised using template engines that copy well-known web services and download portals. Various types of web scripts including banners, pop-ups, ads and others can supplement them to increase the infection ratio. The other tactic involves the use of browser hijackers that represent counterfeit browser plugins. They are often distributed on the official software repositories of the most popular web browsers. Usually the code is made compatible with them and the majority of them: Mozilla Firefox, Google Chrome, Safari, Internet Explorer, Opera and Microsoft Edge. Once installed they can modify the settings of the applications by redirecting the victims to a malware page. The virus infection is caused during the initial delivery. The initial security analysis of the LockMe virus does not reveal a correlation with any of the known malware families. This means that it is likely that the threat has been made by the criminals behind it. Another likely possibility is that this is a custom code acquired through the hacker underground forums. Anonymous Data — This type of information includes system hardware information and details on the operating system which are used by the malware operators for statistical purposes. Personally-Identifiable Information — This type of information can be used to directly expose the victim’s identity. The module can gather files that are related to the victim’s name, address, social security number and etc. The LockMe virus can also be programmed to extract strings related to online accounts, passwords and etc. All of your files have been Encrypted with military grade system and impossible to brute force, cracking, or reverse engineering it ! *) Don’t try change the ‘.lockme’ extensions , if you change it , your all files can be broken and can’t be restored forever . *) If you’ve made a payment contact [email protected] | [email protected] . The hackers use the standard blackmail tactics by demanding a ransom fee of 0.03 BTC which at the current currency conversion rate is about $230. 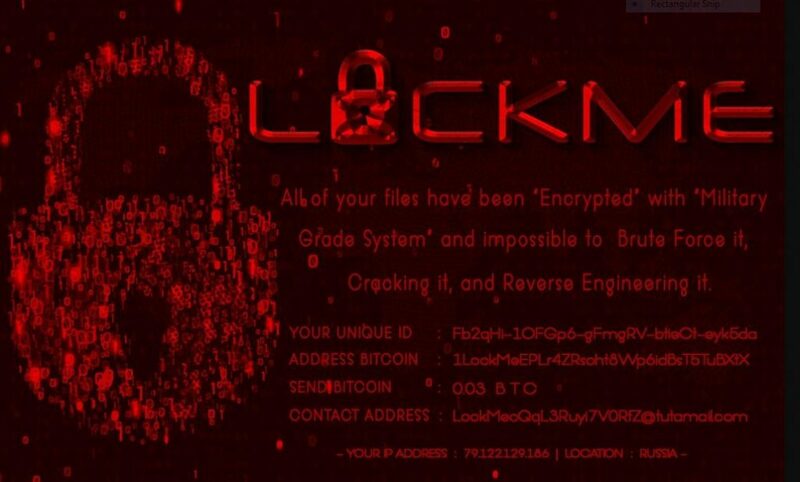 The security analysis reveals that the LockMe virus can generate a ransomware note in many languages — a total of 54 distinct versions have been found. The displayed versions is probably shown depending on the regional settings that have been selected during their operating system installation. Cracking it, and Reverse Engineering It. In order to make sure that this malware is permanently gone from your computer, you should follow the manual or automatic removal instructions down below. If you have the experience in removing ransomware manually, we advise you to focus on the first 2 steps from the manual removal and to look for the registry files which we have explained in the analysis part above. Otherwise, if you want a more automatic and faster solution and lack the expertise in malware removal, we urge you to download an advanced anti-malware program, which aims to automatically perform the removal operation of LockMe ransomware and secures your computer against future infections in real-time. If you want to restore files that have been encrypted by this ransomware infection, we advise you to try out the alternative tools for file recovery down below in step “2. Restore files encrypted by LockMe Files Virus”. They may not guarantee fully that you will recover all of the files, but if you haven’t reinstalled your OS already, there is a good chance that you might just restore them. Threats such as LockMe may be persistent. They tend to re-appear if not fully deleted. A malware removal tool like Combo Cleaner will help you to remove malicious programs, saving you the time and the struggle of tracking down numerous malicious files. Threats such as LockMe may be persistent on your system. They tend to re-appear if not fully deleted. A malware removal tool like SpyHunter will help you to remove malicious programs, saving you the time and the struggle of tracking down numerous malicious files. Note! Your computer system may be affected by LockMe and other threats. SpyHunter is a powerful malware removal tool designed to help users with in-depth system security analysis, detection and removal of threats such as LockMe. 1. Install SpyHunter to scan for LockMe and remove them. 2. Scan with SpyHunter, Detect and Remove LockMe. Ransomware infections and LockMe aim to encrypt your files using an encryption algorithm which may be very difficult to decrypt. This is why we have suggested several alternative methods that may help you go around direct decryption and try to restore your files. Bear in mind that these methods may not be 100% effective but may also help you a little or a lot in different situations. Note! Your computer system may be affected by LockMe or other threats. Remove LockMe by cleaning your Browser and Registry. Fix registry entries created by LockMe on your PC. Combo Cleaner is a powerful malware removal tool designed to help users with in-depth system security analysis, detection and removal of threats such as LockMe. Step 5: In the Applications menu, look for any suspicious app or an app with a name, similar or identical to LockMe. If you find it, right-click on the app and select “Move to Trash”. Step 6: Select Accounts, after which click on the Login Items preference. Your Mac will then show you a list of items that start automatically when you log in. Look for any suspicious apps identical or similar to LockMe. Check the app you want to stop from running automatically and then select on the Minus (“–“) icon to hide it. Remove LockMe – related extensions from your Mac’s browsers. A pop-up window will appear asking for confirmation to uninstall the extension. Select ‘Uninstall’ again, and the LockMe will be removed. When you are facing problems on your Mac as a result of unwanted scripts and programs such as LockMe, the recommended way of eliminating the threat is by using an anti-malware program. Combo Cleaner offers advanced security features along with other modules that will improve your Mac’s security and protect it in the future. Hey !, I found this information for you: "LockMe Virus – How to Remove & Restore .lockme Files". Here is the website link: https://sensorstechforum.com/lockme-virus-remove-restore-lockme-files/. Thank you.